12 1/2 x 10 x 6 in. During my years in Rochester, NY, I took my first papermaking workshop, where teacher Patti Ambrogi encouraged us to toss any found materials into the pulp bath, including seedpods, sticks, and other natural ingredients. 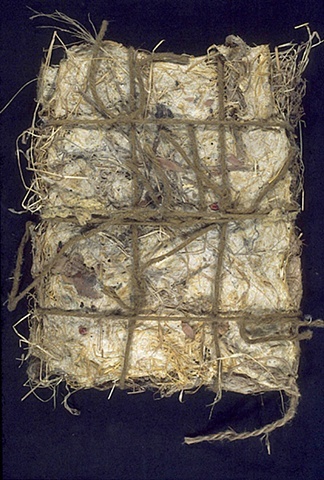 Organic Seed Book, a stack of handmade pages wrapped in twine, looks like an ancient artifact unearthed from an archeological site. Although it did not sprout, this piece was a precursor to my Seed Sprout Books that germinated in the summer of 1982 during my second papermaking class with Joe Brown. All these bookworks stand in stark contrast to the fine leather bound volumes I was making at that time under the tutelage of Fred Jordan.